"You have one of the greatest Tango instructors ever! We are forever thankful ... Audrey (Martinez) , we cannot thank you enough for the time...& effort & support you gave us to perform our wedding first dance...we learned a lot & knew from the first day how amazing you are! 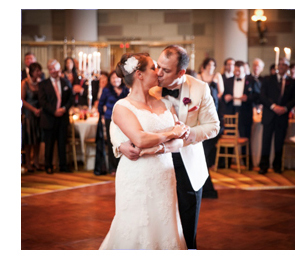 We had the best time learning, practicing & dancing on our wedding day!" ". . . We were so prepared, knew the dance so well and had danced together so much, we handled it with ease. 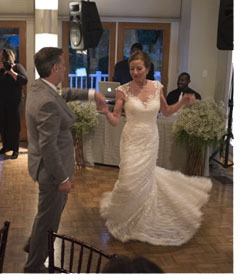 Everyone said they had no idea we could dance like that and credited me with working the miracle of making my new husband dance, and dance so well!" "We wanted to ... thank you for working with us. We had a wonderful time in each of our lessons and learned enough to make our first dance fun and fabulous. I really can't thank the Dance studio and our instructor enough -- we really learned a lot and enjoyed every minute of the process. (She was) so patient with us and made everything seem so easy! We also wanted to send along a picture of us doing the foxtrot -- you were right -- everyone liked it!" " Paolo (Lanna) & Elena (Iannucci) - Thank you both for helping us pull off our first dance in such a short period of time and with such amateur dancers! Thank you for your patience, for your confidence in us and to Paolo for remixing our music -- making it short enough for us to get through it. It made our first dance a memorable one! We're looking forward to more dancing!" 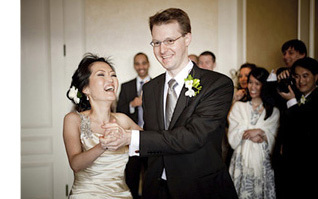 " Teddy (Kern) helped Tyler and me learn the foxtrot to 'Fly Me To The Moon' for our first dance for our wedding in May. Our dance was an overwhelming hit and we had the time of our lives! We can't thank her enough!!!" Let us help you make your First Dance a beautiful memory!